The accolades and prognostications keep coming in. The expansion of the Canal is one of those stories that will keep building until next year’s launch. And as it gets closer, every article will mention Panama’s rise. This will translate into continued interest in the country; for investment, tourism and retirement. Expect a fevered pitch of media coverage in 2016.from Time this week: “The economic rewards of efficiency have made Panama City’s vertiginous skyline the equal of Miami’s. A third of the nation’s GDP flows from the canal, counting ancillary businesses like the railroad–first built to carry California gold miners across the isthmus–and the ports, which do a brisk business shuttling containers from large vessels to smaller ones. The $5.25 billion expansion is projected to double the canal’s capacity. Panamanian officials hope their country can ultimately become the place things not only pass through but also come together–the pieces in all those containers assembled and shipped onward with value added. “We could be a Singapore,” says Rodolfo Sabonge, a former senior canal official now heading the University of the Caribbean. “The last time someone dug a trench through the Isthmus of Panama, the result was declared the greatest wonder of its age. It’s being done again–mountains toppled, earth moved by the millions of tons, oceans connected–and the wonder this time is that anyone notices. Clearly we are in a different age. When the Panama Canal was first cut, ships were the only way from one continent to another, and canals were what shrank the world. They still do, in maritime terms, and with shipping driving global commerce as never before, a second age of canals is upon us. The Suez, which has connected the Mediterranean to the seas of Asia since 1869, is adding lanes to accommodate two-way traffic on much of its 120 miles (193 km) through Egypt. Turkey has plans to dig a canal parallel to the Bosporus Strait linking the Black Sea and the Mediterranean. And China is planning to spend up to $70 billion on an entirely new canal across Nicaragua, the route the U.S. championed before bisecting Panama. 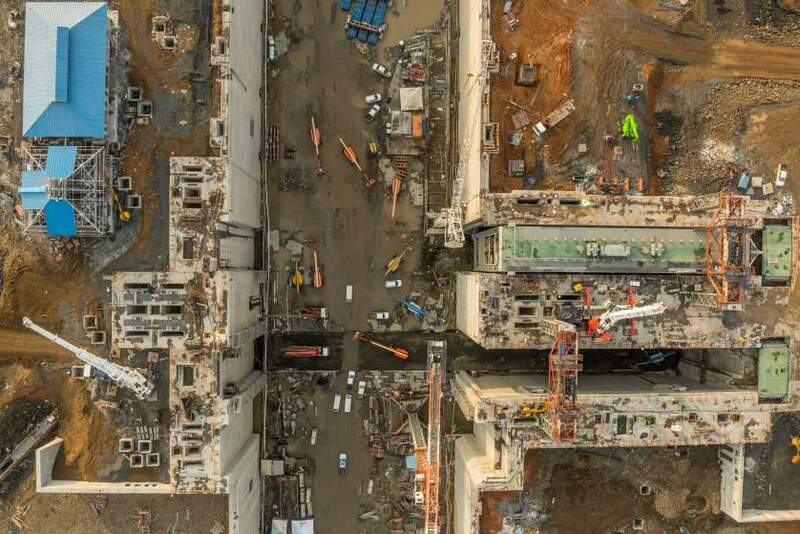 But wonders these days are something you hold in your hand–the tiny computers that construction workers are extending at arm’s length to snap selfies as the 9 million-lb. (4 million kg) gate pivots into its slot. Small drones whiz past with a dragonfly buzz, carrying even smaller cameras, miniaturization being very much the current direction of progress, even as ships grow larger. And larger. The Vessels the Panama Canal was first built to accommodate, when it was completed in 1914, were 106 ft. (32 m) abeam, a width that dictated the maximum for oceangoing ships known as Panamax. But after accepting control of the canal from the U.S. in 2000, Panamanian officials surveyed shipbuilders’ intentions and glimpsed a future that spelled the canal’s obsolescence. The problem was not the largest ships on the sea–the gargantuan bulk carriers known as Capesize. No canal can accommodate them. The problem was the more modest ocean workhorses, the container ships that account for 60% of the world’s shipping–a great deal of it between China and the U.S. East Coast. Though a million vessels passed through Panama in the canal’s first 100 years, shipping–like globalization itself–operates on economies of scale. And the scale was outgrowing the canal. A ship 106 ft. wide and 965 ft. (294 m) long–the maximum Panamax–can carry perhaps 5,000 containers. Widen the beam to 160 ft. (49 m) and the length to 1,200 ft. (366 m)–the size of a ship that can fit in the new channel–and the container count rises to 13,000. If Panama didn’t make room, those new ships would reach America from China via the wider Suez, imperiling Panama’s surging national economy. So in 2007, digging commenced. When the new locks open, probably early next year, ships arriving from the Pacific will pass under the Bridge of the Americas and approach what amounts to a toll plaza. Smaller vessels will bear to the right, toward the locks that for a century have lifted ships 85 ft. (26 m) to the level of the Gatun Lake, the giant man-made pond that makes up much of the canal. At the other end of the lake, another set of locks will lower the boats back to sea level, to continue their journey into the Caribbean. Bigger ships will bear left to the new locks, mammoth chambers wide enough that vessels no longer need to be guided through them by cables attached to the “mules” that still operate on the old locks. Cheerful little locomotives the color of a chewing-gum foil wrapper, they delicately center a Panamax with just 2 ft. of clearance on either side. With a roomy 20 ft. (6 m) extra in the new locks and rubber bumpers, tugs will shepherd the ships through, the norm at other canals. The new locks also operate differently. While the old chambers feature miter gates–which open and close like double doors–the new gates, made in Italy, slide in from one side, like a pocket door. The freshwater from the lake above will rush in and out through cavernous, curving culverts that, as workers complete the finishing touches, feel like something from King Solomon’s Mines. Basins next to each lock will store water for a single reuse, reducing freshwater usage by 7% per passage. The same new locks are also being installed on the Atlantic side, but in the midsection of the isthmus all ships will continue to steam along the original waterway, which has been upgraded. Curves in the famous Culebra Cut, named for the mountain ridge the original canal had to be cut through, are being widened to ease turns for the bigger ships. Metal communication towers are going up behind the picturesque lighthouses that string the length of the canal, along which 625 new lights are being installed. Everything is bigger and more efficient–but also a bit less interesting than in the old canal, like a dull I-95 compared with the kicks of Route 66. But superhighways are what the Seven Seas have become. The number of cargo ships worldwide has more than quadrupled over the past 20 years, to 50,000 vessels carrying $13 trillion in goods each year. In a world economy bound together by supply chains–cars to China, sneakers to Houston–sea travel long ago ceased being leisurely. The canal takes reservations months in advance, collecting a 15% booking fee on a toll that often runs to $400,000 but guarantees passage in no less than 18 hours. The economic rewards of efficiency have made Panama City’s vertiginous skyline the equal of Miami’s. A third of the nation’s GDP flows from the canal, counting ancillary businesses like the railroad–first built to carry California gold miners across the isthmus–and the ports, which do a brisk business shuttling containers from large vessels to smaller ones. The $5.25 billion expansion is projected to double the canal’s capacity. Panamanian officials hope their country can ultimately become the place things not only pass through but also come together–the pieces in all those containers assembled and shipped onward with value added. “We could be a Singapore,” says Rodolfo Sabonge, a former senior canal official now heading the University of the Caribbean. View of the Panama Canal Expansion project on Pacific side. April 23, 2015. 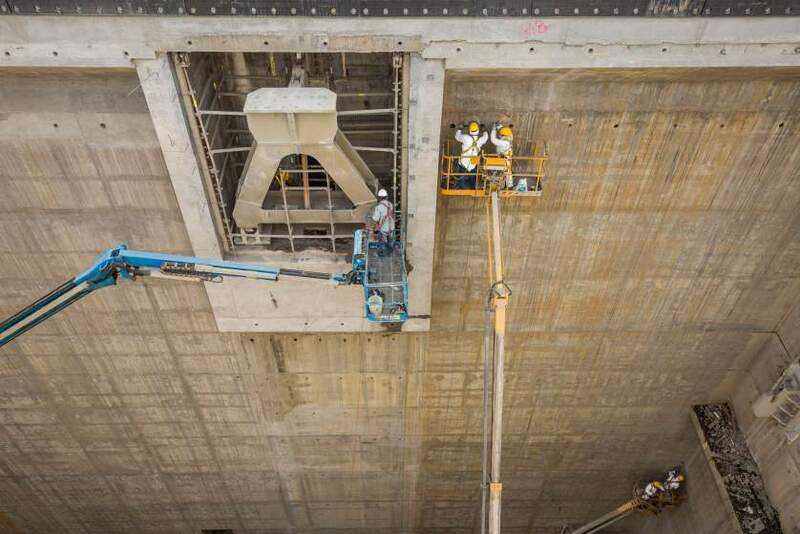 Workers make final refinements to the concrete and steel slot that will hold the last gate on the Pacific side of the Panama Canal Expansion project . April 23, 2015. 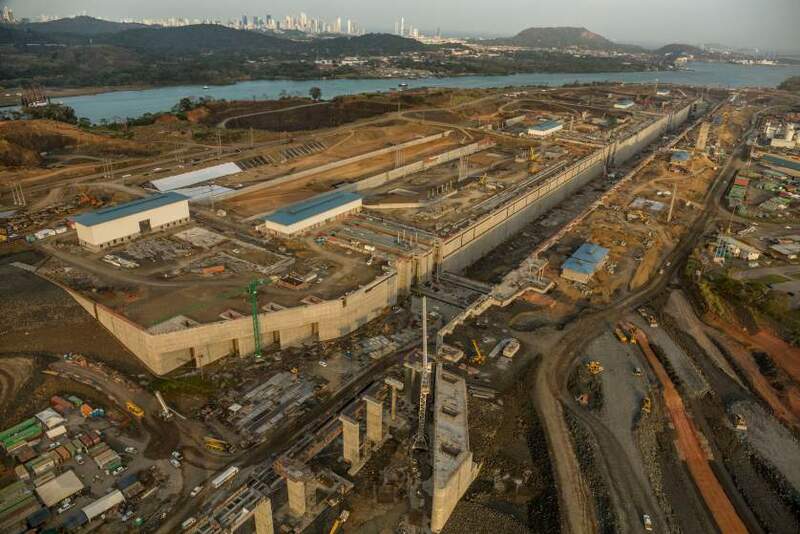 Overview showing part of a lock on the Pacific side of the Panama Canal Expansion project , April 22, 2015. 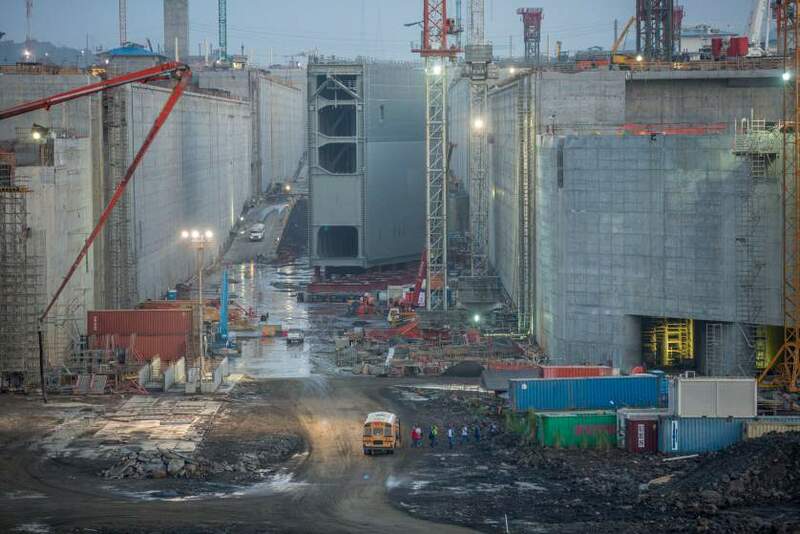 The final lock gate waits to be installed on the Pacific side of the Panama Canal Expansion project. April 23, 2015.